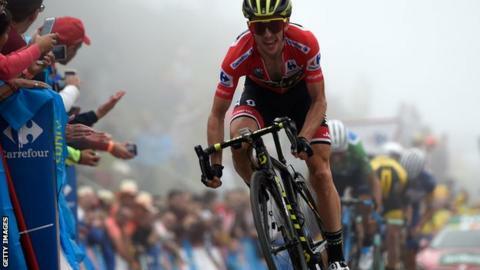 Britain's Simon Yates increased his Vuelta a Espana lead as Thibaut Pinot claimed a summit victory on stage 15. The French rider tore away from an elite group of red jersey rivals at Lagos de Covadonga, an uncategorised climb with sections up to 20%. Miguel Angel Lopez finished second, with Yates third, gaining time on Nairo Quintana and Alejandro Valverde. English Mitchelton-Scott rider Yates, 26, now leads Valverde by 26 seconds, while Quintana is 33 seconds behind. He began the day 20 seconds clear of Valverde and 25 clear of the Spaniard's Colombian Movistar team leader Quintana. Groupama-FDJ rider Pinot's decisive attack from 6km out saw him finish 28 seconds ahead of Astana's Colombian Lopez and 30 ahead of Yates, also claiming 10 bonus seconds for finishing first as he moved up to seventh overall. Having begun the day two minutes and 46 seconds behind Yates, he was perhaps afforded space to push clear on the cloud-covered slopes in Asturias. Down the road behind him, there were a series of exciting attacks and counter attacks as Yates tried repeatedly to open a gap on Valverde and Quintana, but each time he was closely marked and chased down. However, he did at least manage to claim the four bonus seconds on offer for third place, also opening a small gap on both his main rivals in doing so. "It was difficult, if you did get a gap it was hard to maintain, there was a lot of head wind, so nothing really happened in the end," Yates said. "It was a very strong attack [from Pinot], he came form behind with a lot of power and speed so I can only congratulate him, it was a great move. "But I feel good, and if I can hold the same form and same legs I will be very happy." Monday is a rest day before Tuesday's a 32km individual time trial from Santillana del Mar to Torrelavega in Cantabria.